It's so close to the rebirth ...in Hell! The creativity of this band (so many of musicians and people was inspired by their songs!) can be discussed endlessly - as for me rememberance of the origin of the musical style that chose the name of the song by its title (we are talking about the "Black Metal" - this is more then enough, as for me)! The title track begins the triumph of traditional metal Venom - 100 Miles To Hell (EP), creating stylistic frames and building so severe castle of rough musical rage. In this composition in verses, a rapid flow of drive sweeps everything from its path, in refrains meditations on the distance to hell subordinate to its influence the musical image, in bridges instrumental ideas emit a bright extravaganza of ageless energy. The uncontrollable rage of We The Loud sparkling drive sweeps from its path into the entry and buys all obstacles, rapidly approaching the majestic instrumental finale, enchanting its significance and confident procession to the chosen goal. Staggering from side to side, the Beaten To A Pulp introduction continues in the playful playful moves in a dark fog, in a chorus sweeping away in a swift stream of guitar passages and a frenzied drive into grim pursuit, slowing its rapid advance in the dark temptation of the instrumental part, solemnly anticipating the final chorus of the final composition and the entire album. Let's add discussion about the technical and artistic component of this genre on a concrete example to the review about unforgettable legends, whose stylistics became the source of inspiration for many. 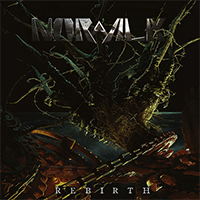 Norwalk - Rebirth (EP)! Mystical motifs in the Neverland introduction are shrouded in enchanting dark shades, bass guitar solos, then giving way to the dominant role of the sologitare. The introduction of the vocal precedes various musical ideas that transform the composition into various forms of ancient sinister prophecies. Vocals first discredits mysticism with a wave of drive, but then the musical motifs change their outlines again and again, the vocals complement these transformations with their changes, referring both to the pure and to the harsh, sometimes introducing short gouging inserts. Twisted in a dim dandelion, the On My Way (To Norwalk) main motifis transformed again and again, the vocals first freezes in a changeable recitative, then swings in a sparkling romantic dime to unknown temptations - striving for the band's title, nothing else. The epic ballad spreads magic potions into the Madness 2.0 introduction, recreating many forgotten legends and inventing more and more fairy tales. Vocal polish these magical tales with additional shades, rushing for musical changes in their reflections. The flow of drive of the I Empty intro brings all the obstacles out of the way, the composition is further based on the discussions of Dr. Jekyll and Mr. Hyde. Another controversy two contrasting entities finalizes the composition.